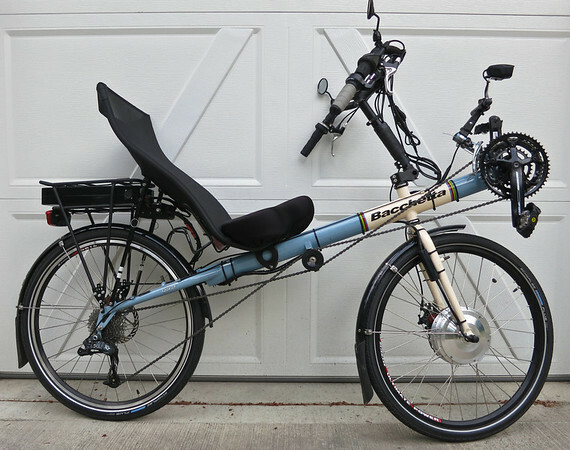 Just converted my 2012 Bacchetta GiroÂ 26 with the eZee conversion kit, work done by the good folks at Electric & Folding Bike Northwest. Holy cow. The transformation is amazing. Went with the front hub kit for overall bike balance, didn’t want to go rear hub and overload the back end. Kit is 500 watts/Lithium battery: good for ~30 miles, cruising speed can go up to ~22mph, howeverÂ speed limitÂ law for on-road is 20mph. Charging time is ~6-7 hours. Added the eZee rear and front lights. The front light is super bright, will vaporize deer-in-the-headlights on contact. Upgraded tires to Schwalbe Marathon Plus for better stability and puncture resistance. Have both pedal assist (PA) and throttle. PA is great for long pulls on the flats and climbs where little shifting is needed. I use the throttle when getting underway, particularly at a traffic light change. Shout out to Mr. Hawkins at ElectricVehiclesNW.com for the very clean wiring and install job. Recumbent conversions need a little extra fine tuning and custom fitting. Now for the punch line: I reducedÂ my cycling commute in half. Half.Â HALF. From 55min to 25. That puts it close to car/motorcycle times, minus the stop-and-go annoyances.Â In fact, my commute just became awesome, as this is so much fun to ride. 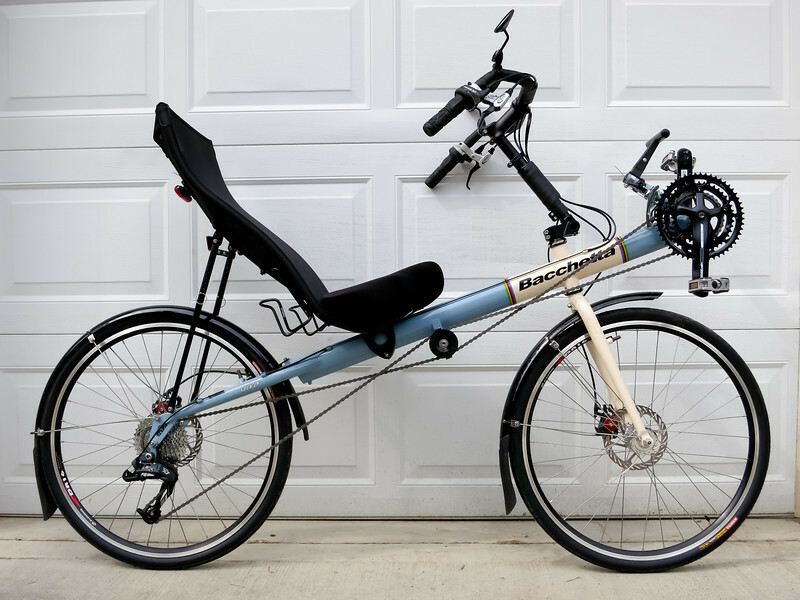 Recumbents are typicallyÂ speedy on flats and downhills, neverÂ cheetahs going up climbs, and now the electric conversion makes riding a completely new experience. It’s a different kind of hybrid transportation, far less expensive than a Prius or Leaf, and still getÂ a workout. Next time someone asks “which bike should I buy?”, I’m going to make sure the word ‘electric’ is somewhere in my reply.